Taking notes on a Mac is as simple as opening Notes and starting to type. But the best way to take notes actually depends on your own personal habits and workflow. Some people are better with sticky notes that stay on your screen all the time, or an app that syncs seamlessly with Evernote. If your notes tend to turn into blog posts, an app like Blogo can keep them organized until they’re ready to publish. Setapp collection is packed with useful apps that might fit your unique way of note-taking better than a one-size-fits-all solution like Apple’s own Notes. With over 100 apps to choose from — and a free trial — you’re bound to find the best app for jotting down your thoughts. Here are our favorites. Unclutter is perfect for capturing the smallest germ of an idea, since it works as both a sticky notes app and a clipboard manager. Because it’s always open, you can write down an idea the second you have it. Unclutter’s notes are sticky because they never go away, and the interface is even better than default sticky notes on the desktop since Unclutter doesn’t clutter up the view when you’re working in other apps. To access Unclutter, you can just mouse to the top of your screen and scroll down (or choose your own key command), and its three-pane layout appears, with sections labeled Clipboard, Files, and Notes. In Clipboard, you’ll see a list of everything you’ve copied to your Mac’s clipboard, ready to re-copy and paste whenever and wherever you need. You can star favorite items to keep them accessible here forever. Files is a handy place to drop files you need an easy access to, like things you’re working on right now. Unclutter’s Notes pane is a text field where you can type out notes and also drag text and links into. You can keep one long-running note to yourself or create multiple notes and view them in a list — the Search field searches the full text of all of your notes, so you can always find what you’re looking for. All panes are easy to resize to give yourself more room. 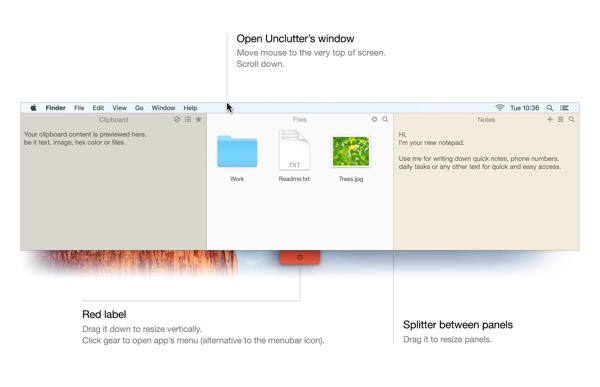 Unclutter is easy to fit into your workflow since it’s always there, and the search field helps you find things later. Dropbox integration even syncs your Unclutter files and notes across multiple Macs. 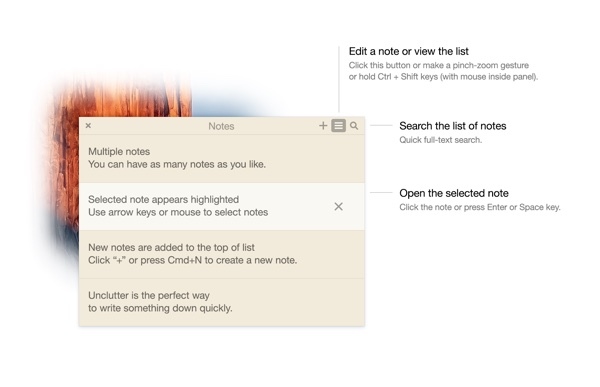 When you want to turn your thoughts into something more edited, you can choose another note-taking app from Setapp. Blogo makes it easy to post to WordPress, Blogger, and Medium right from a native Mac app. Besides giving you a place to write in Markdown or plain text, Blogo lets you build and format robust blog posts, complete with links, images, and other media. You can add tags and schedule your posts to go live anytime. Once they’re live, Blogo lets you manage comments and edit your posts, and the app’s search function can help you find old posts to link to when you revisit a topic. Blogo even makes it easy to gather links and media to blog about. It has a Safari extension that lets you save URLs, videos, images, and highlighted text with a single click. The app’s iOS extension lets you send content to Blogo from apps like Instagram, Instapaper, News, and more. 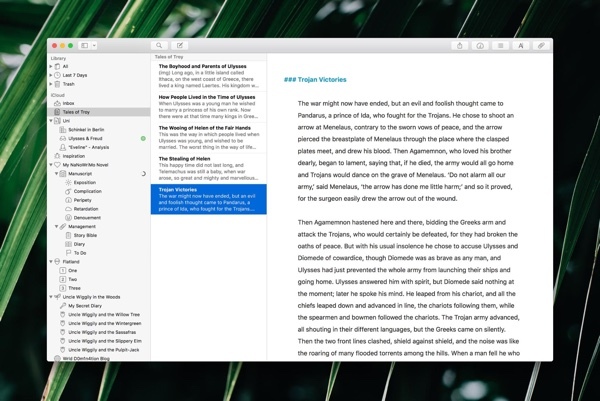 Ulysses is a writing app with outstanding organizational features, so you can move from notes to an outline to a full manuscript. In fact, Ulysses is a popular app for Mac users participating in NaNoWriMo, a month-long exercise that encourages people to write a novel. It has all kinds of features to get you to write more, from flexible themes to eliminate distractions, to writing goals that count words written. You can use Ulysses to post to a WordPress blog, export Word documents, or even format an entire ebook. But at the most fundamental level, it’s a great note-taking app because you never have to save anything, and your writing can sync between multiple Macs and iOS devices via iCloud or Dropbox. Your notes can contain images, keywords, and PDFs. The search function is incredibly thorough; for example, you can find keywords in notes created before a certain date, in case you want to see how your thoughts about something have evolved over time. While other note-taking apps are flexible enough to handle work and personal topics side-by-side, Studies is created especially for those in academic settings. It’s designed to take your notes and turn them into study notes, which are basically flashcards on steroids. Instead of a traditional two-sided flashcard for memorizing terms, the study notes in Studies can have as many “sides” as you need. They can contain text, images, videos, even audio. This makes them flexible enough that you can create study notes for any subject, from accounting to zoology. 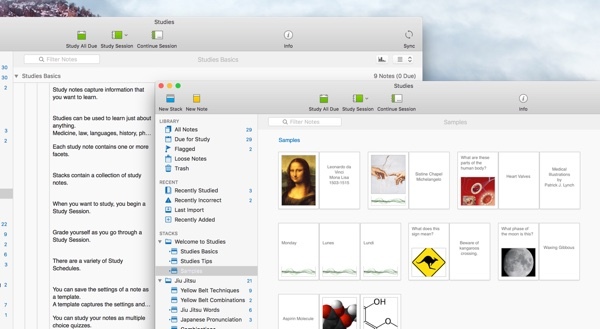 You can share study notes with classmates or even download pre-written note sets from Quizlet. Then, you can use Studies to quiz yourself. The app can set up a schedule for you, based on prepping for an exam or just learning the material as quickly as you can. It chooses notes to study every day, and the cards you got wrong will re-appear more frequently in future sessions, so you can get it right. All these note-taking apps are available in Setapp, so you have access to them all for your ideal workflow. You could start an idea as a sticky note in Uncluttered, paste it into Alternote, where you flesh out the idea a little more. That syncs it to Evernote, which you can also connect to Blogo, and turn that note into a full-featured blog post for the world to read. It’s all up to you, and Setapp lets you focus on the work, instead of finding the right apps, buying them, and then buying them again for updates. Just consider subscribing once and then all you have to do is write.